Spring Valley High School video: We have no clue whether cops in schools make kids safer. 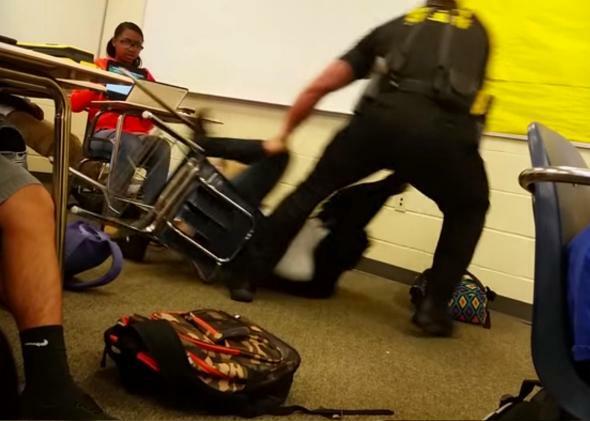 The young woman violently thrown by a school police officer in Columbia, South Carolina, had recently been orphaned. We know that thanks to a Wednesday report in the New York Daily News, which wrote that she had only just been placed in foster care after losing her mother. Those abysmal life circumstances might cause any teenager to act out—and in this case, the extent to which she was acting out is under dispute. Her teacher and a school administrator, who chose to escalate a situation to include law enforcement, either didn’t know about her situation or didn’t care. Thanks to the shocking video footage of the incident at Spring Valley High School in Columbia, America has spent the first half of this week having a discussion about the role of law enforcement in public schools. Across the country, taxpayers spend millions placing police officers in schools, often to solve problems we have no evidence they actually solve. And however you feel about what police officers should do in schools, we didn’t put them there to do what one did in Columbia. In theory, the presence of police officers was supposed to solve the exact problem many now accuse it of creating. When such programs were popularized in the 1990s and early 2000s, advocates said they would create better relationships between law enforcement and troubled neighborhoods, fostering trust and understanding. They’ve obviously long failed in that regard. Now, proponents say they’re there for the worst-case scenarios, for wildly improbable incidents like school shootings. But they’ve had a very different impact on thousands of kids, turning fairly mundane disciplinary scenarios into encounters with the legal system. In places like Columbia, we’ve replaced basic school discipline with the force of law. As Slate’s Jamelle Bouie argued this week, it’s exactly such a system that impacts the most vulnerable and troubled children the most deeply. And to make it all the more troubling, a look at the available numbers reveals we have no way to know whether having officers in schools actually keeps kids safe. Despite the total uncertainty around their effectiveness, even fairly progressive politicians have pushed for more officers in schools—typically as “solutions” to school violence. After the Sandy Hook Elementary School shooting, for example, the Obama administration put up the funds for 1,000 additional school police officers in schools across the country. More than a decade before that, the use of so-called school resource officers spiked after the Columbine shooting in 1999. According to a report by the Congressional Research Service, between 1997 and 2000 the number of officers in schools jumped from just under 9,500 to almost 14,000. It’s appeared to have leveled out since then, though the latest year for which numbers are available is 2007. “While the actual likelihood of an officer stopping a shooting is very, very low, [policymakers] are spending all of this money, which only makes it more likely that we see more incidents like the one in South Carolina,” says Jonathan Blanks, a research associate at the libertarian Cato Institute and the managing editor of policemisconduct.net, which keeps track of instances of police misconduct nationally. As Blanks suggests, the incident in South Carolina is the perfect example of a school sacrificing actually serving a child’s individual needs for the blunter strategy of police intervention. And in the case of the student in South Carolina, an individualized strategy was probably incredibly necessary. This might be particularly jarring in the case of Spring Valley, as it’s a fairly typical high school, if not one that’s slightly wealthier and higher achieving than average. As Slate’s Ben Mathis-Lilley pointed out, the school is several percentage points below the state average for poverty, and its attainment scores are slightly higher. * While every child is dealing with their own pain, it’s unlikely that very many students at that high school were dealing with the type of transformative life changes being experienced by this student, and yet the school still had no room or willingness to adjust its behavioral system for her obvious needs. While schools are already unlikely to take students’ life circumstances into account when choosing punishments, police presence in schools makes this even less likely to happen. Unlike teachers and administrators, who may use discretion, police follow strict systems for student intervention that allow for almost no leniency or variation. These policies vary widely. The American Civil Liberties Union of Texas found that in towns just a short drive away from each other, school officers used an “enormous variety” of standards to dictate how they respond to a child’s misbehavior. “For example, if a child in a Killeen school declines a [school resource officer’s] instruction to stand up from a classroom chair, under Killeen’s policy the SRO may then pepper spray the child. But if that same child declined a SRO’s instruction to stand up from a chair in a Dallas school, the SRO would first have to use bare hands, and, if necessary, physical strikes to gain compliance from the child before using pepper spray,” reads the report. Such variance, along with huge differences in reporting standards and guidelines for what type of officer can be assigned to schools makes it incredibly difficult for researchers to study this field. It’s essentially impossible to know how widespread of a problem officer misconduct is inside schools, or, really, to do any nationally conclusive studies at all. Michael Thompson, the director of the Council of State Governments Justice Center, told me the differing national standards make it impossible to conduct studies that allow you to compare one district or state with another. “You can have a uniformed municipal police officer based in a school, have the same thing but without a firearm, have a private security officer or have a police force employed by the school district or any permutation of that,” he said. “It’s difficult to say whether or not it works, because then you have to define what ‘it’ is.” The research void makes it difficult for researchers to identify good programs that should be replicated and bad programs that should be dismantled. But even though policymakers have no clear-cut proof that police presence in schools works, new programs costing millions of dollars are being encouraged all over the country as a panacea to school shootings, gang violence, and simple student defiance. So what do we do with all of these widely varying standards and rules? In the absence of real research, Thompson said the only thing school districts can do is open the conversation up to their communities, so they can make the right decision and schools can staff themselves with the right people. “The school needs to ask itself what problem its trying to solve by having a police officer in the building,” he says, adding that officers might be able to prevent larger safety problems but won’t solve the problem of a chaotic school culture. Depending on the problem, officers may be the solution or they may just increase the tension. *Correction, Nov. 2, 2015: This post originally misspelled Slate writer Ben Mathis-Lilley’s last name.